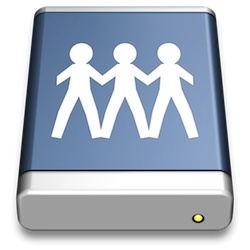 If you’ve visited the Sharing Preference panel in the newer versions of Mac OS X you may have noticed there is no longer the direct option to enable an FTP server to share files and folders. Well, at least there isn’t an obvious option, but the FTP and SFTP server function does still exist, the two have just been split into different functionalities, with the new versions of OS X preferring SFTP rather than FTP. Regardless of what you want to use, setting up a server for either of them is extremely simple, and we’ll walk through how to start either an FTP or SFTP server in OS X. Each of these FTP/SFTP server tricks work in all new versions of OS X, be it OS X Yosemite 10.10.x, Mavericks 10.9, Mountain Lion 10.8, or 10.7 Lion. 220 ::1 FTP server (tnftpd 20100324+GSSAPI) ready. You know the server is running. If you don’t see that, then the server either hasn’t finished starting yet or you didn’t enter the command properly. You can then FTP from other Macs via the same ftp command, or by using the “Connect to Server” option in the Finder. Update: Our much more detailed guide on Remote Login and SSH Server is here. Note: The FTP and SFTP servers are different, and enabling one does not enable the other. SFTP is recommended because of the default encryption layer and secure transferring. As the command suggests, this unloads the ftp daemon and shuts down the server. Obviously you can only shut down and disable the FTP server if it was enabled to begin with. Disabling SFTP is just a matter of unchecking the “Remote Login” box that sits within the Sharing Preference Panel of OS X. Though it’s not entirely clear why Apple pulled the easy frontend to FTP sharing, it’s possible they are simply choosing to favor SFTP because it’s a more secure protocol, and by enabling one you enable both. Nonetheless, FTP and FTPS servers are still around (as are clients for that matter), so it’s simply a matter of using the terminal to enable the server side of things. Generally speaking, because SFTP is much more secure, that is what you should be using for remote file transfers and connections though, so keep that in mind if you plan on hosting any kind of server to the outside world, or even if you just want to have secured file transfers yourself to and from remote Macs. This is an elaboration on a tip from Land of Daniel via TUAW, who goes on to explain how to get ftpd to launch automatically on reboot, so if you’re interested in that, don’t miss their post. The reason this was removed is that Apple is slowly simplifying OS X so that when it merges with iOS there will be no options to run servers or share files, any sharing will be done through iCloud and within apps. Apple will never merge them, it will loose its web developers, program developers and more if it did. Wow, you’re an idiot. I wish I would’ve found this post four years ago so I could’ve responded sooner. 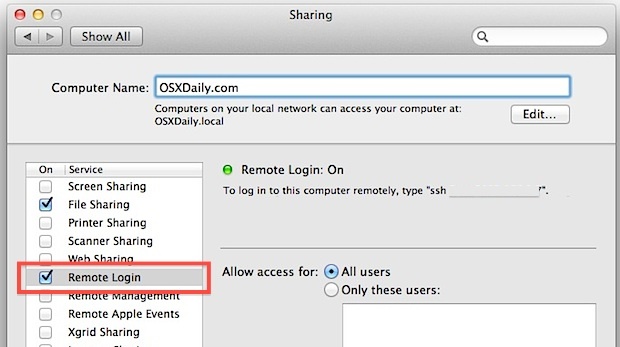 On another note, them Sharing things have nothing todo what iCloud does, how would SSH or CUPS be emulated in iCloud? You are quite the prophet and I can´t beleive you reallised ythis already in 2011 but now there is little doubt that you were right. What if you restart the computer? Does the terminal command need to be entered again? If you only need / want sftp there is no reason to run the command to enable standard ftp, simply enabling remote login (ssh) will also enable sftp. If I did this, is it secure enough for me to give the address to a client that needs to download a large file from me? What address would I give a client? Forgive my ignorance but I have an iMac that, after installing Lion and restarting, I cannot log in to. I can still boot into single user mode. Safe mode does not work. I tried creating a new account via the deletion of the startup file and went through all of that and it still does not work. I can access the files on the iMac from my MBP because FileSharing is enabled. Unfortunately I did not enable Remote Login on the iMac before I had the problem. Since I can boot into the root account via SUM, I assume that I could turn on Remote Login if I knew what to do. I have tried /sbin/service ssh start while in SUM but when I restarted I have been unable to ssh into the system which tells me that login is refused or words something like that. Any ideas? Thanks. I am also looking for similar solution. After enabling ftp, how do I limit a specific user to access only a specific folder on the disk? i beg to differ. if you’ve ever been hacked by a blackhat, you know NOTHING is “perfectly safe”. regaining control over your machine is nearly impossible, especially if you bought your computer for home use, and are not part of “an enterprise”. a “regular” person can’t get help, anywhere. This is the best site i’ve come across, because i can find out what i can disable to keep him out… temporarily. i was not planning to become an InfoSec professional. Does anybody knows how i can enable the ftp in OSX 10.9? ftp has been considered obsolete in favour of sftp since 1999. It’s not unclear why they dropped support, what’s actually unclear is why they did so fifteen years later. Except 10 billion devices have built in FTP support (including for example CCTV IP cameras) but not SFTP. So it’s is still very much required. That means you don’t have an ftp server running. Suggest using sftp rather than ftp. Starting the sftp server using the “Enabling the SFTP Server in OS X” steps in the article is super easy. Do someone have tried whit 10.13? i get “No such file or directory” may be Apple has completely removed FTP? FYI this does not work in High Sierra or whatever the fck it’s called. This still does not work in Mac Mojave. « iPhone 4S Package Label Discovered, No iPhone 5 Next Week?